Although the 2016 Olympics in Rio is not currently on our daily news radar, 2016 is fast approaching and the Brazilian people are working extra hard to prepare for it. Added pressure reigns down on this nation since this is the first time that a South American country and the first time that a Portuguese-speaking nation has hosted the Olympic Games – all eyes are looking to this nation with great anticipation. Unfortunately earlier this year, several complaints had been lodged against the leaders of the Rio 2016 Local Organizing Committee to a point where the International Olympic Committee was concerned that they might have to step in to assist in their efforts to ensure that deadlines could be met. For any nation to prepare for an Olympic Games is a herculean task especially when the Brazilian people, a predominantly poor people, must support its government who is spending billions of dollars towards an event which will last for less than one month – the Olympics will be held August 5th to August 21st, 2016. The hope of the Brazilian government and its people is that the funds spent on the Olympics in Rio de Janeiro will inject billions of dollars back in to their economy just as the World Cup of 2014 had done. It has been reported that the World Cup added $4.4 billion to Rio’s economy. So the members of Rio’s Local Organizing Committee together with the city, state and federal governments are all working in tandem to ensure a memorable but profitable celebration to come for its people and for all attendees. 1. Barra da Tijuca, which is centrally located. This will be the home of the Olympic Village. 2. The Deodoro Sports Complex which was started on July 3, 2014. It is the second largest Olympic zone which will include a few venues previously used in the Pan American Games of 2007. This Sports Complex, which will host several Olympic events, will house among others, the equestrian arena, the Bike park and the Canoe Slalom. The Deodoro facilities are currently on schedule and well under way to being completed before the 2016 deadline date. 4. The Maracanã Zone where the majority of the events will be held includes two stadiums, the Maracanã Stadium (also known as Engenhão) where the opening and the closing ceremonies are to be held and the João Havelange Olympic Stadium, where track and field events will be held. Of all the four zones, this zone is more ready than all of the others because the two main complexes are already in place, although they do need some repairs before their final opening. Of course if travel tips to Brazil are to be of benefit to any visitor, one would need to know not only about the Brazilian food, and the Brazilian people, but also about transportation, and how to get to and from the facilities. Now that more Brazilian people have greater access to wealth and education, they are buying more cars and congestion has become a major problem in many Brazilian cities. The Rio government together with private investment intend to spend over $8.5 billion to upgrade its urban transportation system in order to increase the use of public transportation by 300%. Major improvements will be made to the metro system which being extended about 16 km and to the bus-lines so that they can move people around that city more quickly. Much improvement had been made to the infra-structure in preparation of the World Cup and now efforts continue in earnest as the deadline for the 2016 Olympics in Rio is less than 2 years away. I encourage you to read my articles on each of the referenced topics because they will give you many travel tips on how to ensure that you experience an enjoyable yet safe trip to Brazil and will also give you the Do’s and Don’ts of travelling in and out of that beautiful country. Come August 2016, over 10,000 athletes from around the world are expected to participate in the 2016 Olympics in Rio. Therefore in order to support its efforts, the Brazilian Organizing Committee is in search of thousands of volunteers to make their 2016 Olympics a roaring success. Whether you serve in a food pavilion, or you become a part of the security team, whether you work online, if you serve as a translator or on the front lines meeting and greeting the attendees, Rio’s Local Organizing Committee will need over 70,000 volunteers to make this event happen. So if you are interested in helping, you must be 18 years of age or old and you must be available for at least 10 days during the events. If you meet these criteria (and there may be others), you can apply to be a volunteer at: http://www.rio2016.com/volunteers/. I am certain they will need all of the help that they can get and therefore they will welcome you with open arms. After so much drama surrounding the 2014 World Cup, with incomplete soccer stadiums, numerous protests, over-run budgets etc., the question that has rolled off many a tongue, is: ‘Will Brazil be ready for the Olympics in 2016?” Even officers of the International Olympic Committee such as the President of the IOC said in April 2014, that their preparations were the worst that he has seen. I often recall the statement that so many Brazilians live by, ‘Not to worry, it will get done.’ But as the various athletes, in particular, those participating in boating events, practice for their events, the enormity of the task is so very real. They are already complaining that the water is filthy and it is like a sewer. I also recall many a day when the Pinheiros River that runs through the South of the city of Sao Paulo, emitted such thick chemical fumes, that my eyes watered as I waited on the platform in Pinheiros, for the train to come. So just cleaning up the many rivers that are filled with sludge, waste and filth will be extemely costly and could be a ‘deal-breaker’ for the athletes as well as for Rio. Noone expects that any country should go bankrupt just to entertain the world, but in this case, some of the basic infrastructure is not there and that alone can ‘break any bank.’ Let’s keep watching and I will continue to update you on the latest news as time draws nearer to opening ceremony. Why doesn’t anyone want to host the Olympics 2016? 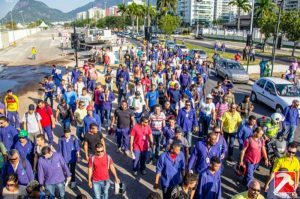 RIO DE JANEIRO, BRAZIL – Construction workers at the Olympic Park in Rio de Janeiro have voted in favor of continuing their strike despite opposition from the labor court. The 2,500 strong workforce are locked in a battle with authorities over higher pay, benefits and working conditions. The strike began on April 3rd and has heaped attention and pressure on the host city who have also been under scrutiny for their ability to meet specific construction deadlines. Especially after the country has been experiencing problems with the timing of the completion of some of the FIFA World Cup 2014 venues. The Olympic competition will be held in Rio de Janeiro in August 2016 has so far been a source of worry for the organizers. It has now emerged that workers who are building the site will defy a court order to return to their jobs after a statement from Rio Mais, a consortium building venues at Olympic Park, announced that the workers will not be returning to their posts. “We don’t know how long we’ll be on strike,” Antonio Figueiredo Souza, president of the construction workers union Sintraconst-Rio, told Reuters. “We are not going back until we get an offer. So far that hasn’t happened and so it looks like this will end up in the Labor Courts,” he added. So far there have already been numerous hitches for the organizers. Hazardous water pollution in Guanabara Bay is a concern for the sailing event, work on the Olympic golf course has been delayed and construction in a cluster of venues in the northern Rio area of Deodoro has yet to begin. Brazil will send federal troops to Rio de Janeiro to help quell a surge in violent crime after attacks by drug traffickers on police posts in three slums on the north side of the city, government officials said Friday. Less than three months before Rio welcomes tens of thousands of foreign soccer fans for the World Cup, the attacks cast new doubts on government efforts to expel gangs from slums using a strong police presence. The city will also host the Olympics in 2016. On Friday, the governor of Rio de Janeiro State, Sérgio Cabral, asked President Dilma Rousseff for federal troops to help stop the attacks on police units overseeing slums across Rio de Janeiro. Shooting erupted on Thursday between drug traffickers and the police near the Manguinhos complex of shantytowns. Three police officers were wounded, the local news media reported, and the attackers set fire to a police post and knocked down power lines.